Is your CEO worth his (her) pay? The Pricing and Valuing of Top Managers! It is the time of the year when stories about CEO compensation are the news of the day, and investors and onlookers alike get to ask whether a CEO can really be worth tens or even hundreds of millions of dollars, in annual compensation. Before I join the crowd, it behooves me to list my biases to start, because it will allow you to make a judgment on whether I am letting these biases color my conclusions. First, I believe that in some companies, CEOs not only add very little in value to the company but may actively be value destroyers, and that in many companies, what CEOs get paid is out of sync with the value that is created by them. Second, before you put me in the economic populist camp, I also believe the only group that should have a role in deciding how much a CEO gets paid in a publicly traded company is its stockholders, and that politicians, regulators and societal nannies should not get involved. Third, if you, as a stockholder, are disconcerted by the disconnect between CEO pay at your company, and CEO value added, you should be cheering on activist investors and pushing for more power to stockholders, rather than less. The early returns suggest that CEOs were paid more this year than they were last year, with collective pay increasing about 12.1% at the largest companies. The portion of that compensation that was in cash increased to 37% from 35% in the prior year, with the bulk of the the remaining coming from stock grants (31%) and options (23%); pension gains (6%) and perks (2%) rounded out the rest. The highest paid CEO in 2014 was Nick Woodman, CEO of GoPro, who was granted 4.5 million restricted stock units, valued at $284.5 million. Both the New York Times and the Wall Street Journal have visual links, where you can compare CEO pay across sectors, at least for larger companies, though the data is still from 2013. 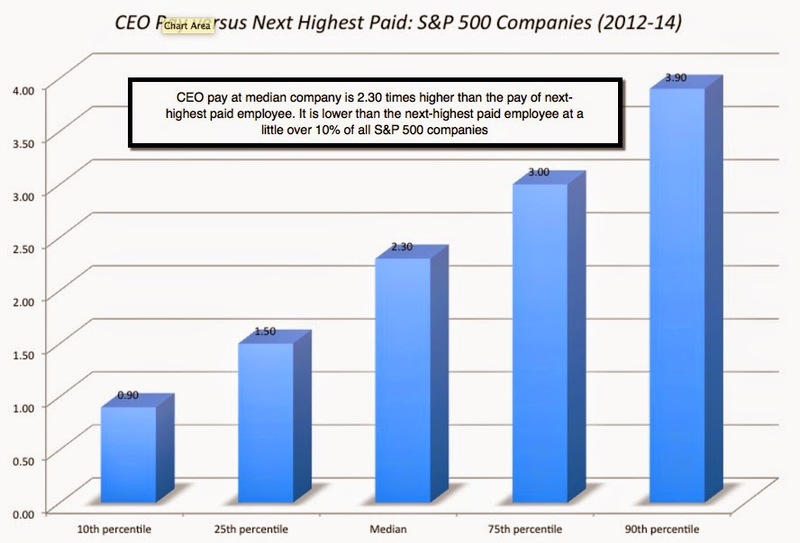 While there has been much talk about the ratio of CEO pay to that of an average employee, and that ratio has indisputably jumped over the last three decades, I found this ratio of how much a CEO gets paid, relative to the next highest paid employee in the company, for S&P 500 companies, using 2012-2014 data to be a more useful statistic. The median CEO is paid 2.30 times the next highest-paid employee at an S&P 500 company, which raises the follow up question of whether he or she adds that much more in value. While we can debate that question, the bottom line is that CEO compensation is large, rising and increasingly equity-based, that the growth in pay has accelerated in the last 20 years, and more so in the United States than in the rest of the world. 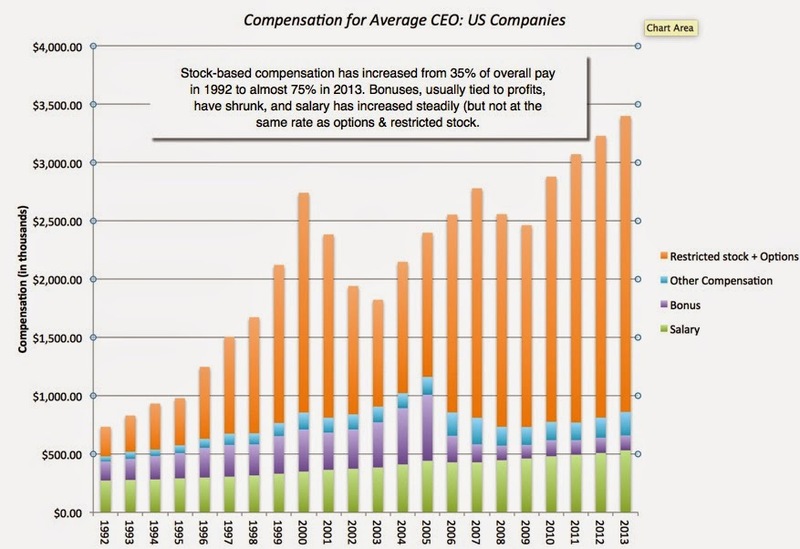 Not only is CEO pay high, but it varies across time and across companies. There are three broad theories, not mutually exclusive, as to why you see that variance. Reward for performance: If a CEO is paid to run a company, it stands to reason that he or she should do well when the company does well, though you can measure "doing well" on three dimensions. The first is profitability, with higher profits (and growth in those profits) translating into higher pay. The second is the quality of the profitability, where the focus is on profit margins and returns on invested capital, with higher numbers on either measure resulting in bigger payoffs for CEOs. The third is to use a market measure of performance, by looking at stock price movements, with CEOs who deliver superior returns (either in absolute terms or relative to the market or the sector) getting fatter paychecks. CEO Market: If you start off with the presumption that it takes a unique skill set to become a CEO and that there is a market for CEOs, the compensation package that the company negotiates with a CEO will be determined by how the market prices his or her skills. CEO Power: If a CEO is powerful, he or she may be able to get a pay package (from a captive board) that is at odds with performance and much higher than what the market price would have been. There are multiple factors that determine CEO power, starting with his or her stock ownership. CEOs who own controlling stakes (and control does not require 50%+) in companies will be more powerful than CEOs that do not. The second is corporate governance, with all of the inputs that determine whether it is strong or weak; companies with weak or compliant boards of directors and little accountability to shareholders will be more likely to over pay their CEOs. The third is CEO tenure, since there is evidence that the longer a CEO stays in place, the more likely it is that the board will be moulded to meet his or her needs. This excellent survey article on the topic summarizes the evidence, and it is both supportive and inconsistent with each of these theories. Xavier Gabaix, my colleague at the Stern School of business, finds that dominant variable explaining changes in CEO pay over the last three decades has been changes in market value, with CEO pay increasing as market value increases. 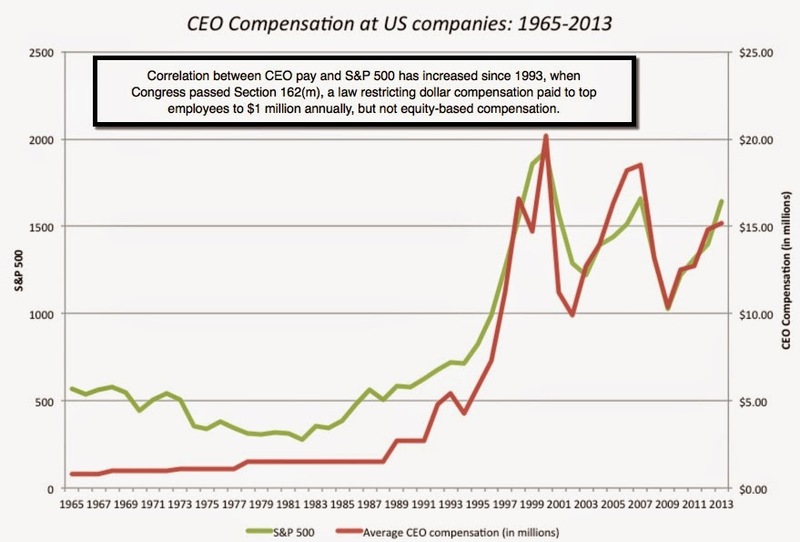 However, that theory in inconsistent with what happened in the 1950s and 1960s, when US stock market capitalization increased with no dramatic jump in CEO pay. 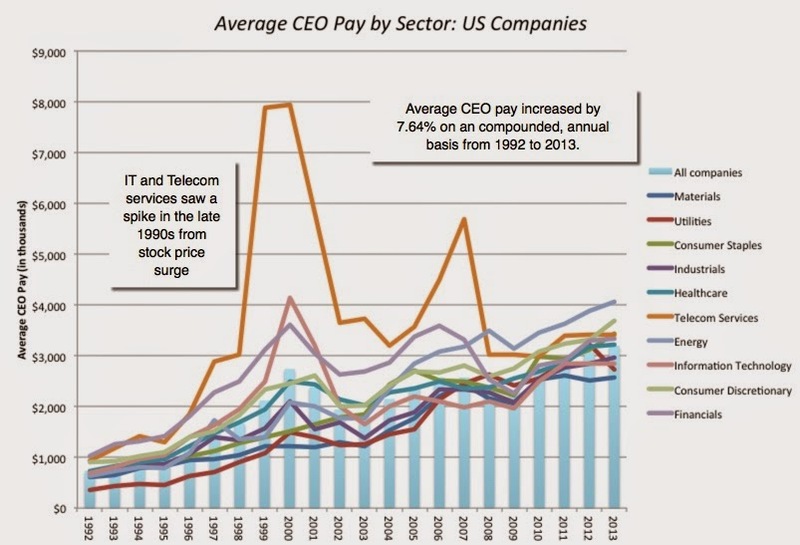 There is some evidence that there are market forces at play, especially in the variation of CEO pay across sectors, but it is difficult to see how market forces can explain the rise in CEO pay in the aggregate. Finally, there is evidence that CEO pay is both more constrained and more tied to performance at companies where activist investors have stakes. At the same time, CEO pay seems to increase (rather than decrease) at firms, after they adopt good corporate governance practices or at least the appearance of such practices. In addition, none of these theories explain why CEO compensation in the US has gone up so much more than CEO compensation in the rest of the world. At the risk of muddying the waters further, I would suggest three more theories that may better explain the pricing of CEOs across time, companies and markets. The Stock Compensation Delusion: The delusion that stock-based compensation is cheap or even costless seems to be widespread among accountants, analysts and companies. Until the accounting rules changed in 2007, options were valued at exercise value in accounting statements, creating the illusion that you could give away millions of options to CEOs costlessly. Even though the accounting rules have changed, analysts and companies seem intent of reversing the effect of the rules, adding back stock-based compensation to earnings, a senseless practice that I have taken issue with before. One of the more dangerous consequences of this mistreatment of stock-based compensation is that boards of directors continue to be cavalier about granting large stock-based compensation awards to CEOs. The Momentum Game: The way companies set CEO pay is more evidence of the me-tooism that characterizes so much of what companies do in corporate finance, where they base how much to invest, how much to borrow and how much to pay in dividends/stock buybacks on what other companies in their peer group do. In deciding pay packages for CEOs, boards look at how much CEOs are paid at the peer groups (a subjective grouping to begin with). Like any other market, this relative pricing game can lead to CEO compensation packages climbing the ladder, since all it takes is one company over paying its CEO to set off overpayments across the entire sector. Put more bluntly, the answer that a board generally offers to the question of why it is paying so much to a CEO is that everyone else is doing it. There is little new or original that I am adding to the discussion. There is a market for CEOs that sets compensation levels, but the prices that emerge from this market may have little correlation with performance and have more to do with mood, momentum and celebrity status. If you add to that the fact that directors seem to either have no interest or no understanding of the value of stock-based compensation grants, you have the makings of a perfect storm. Can you actually value a CEO? I think it can be done, though it will require you to understand how that CEO plans to change the company and quantify the effects. Thus to measure the impact of a CEO on a company's value, you would have to value the company twice, once with an Auto CEO and the other with the CEO in question. With an Auto CEO, the company will stick with the tried and the true, doing what it has done historically in terms of market focus, marketing strategies and risk profile. 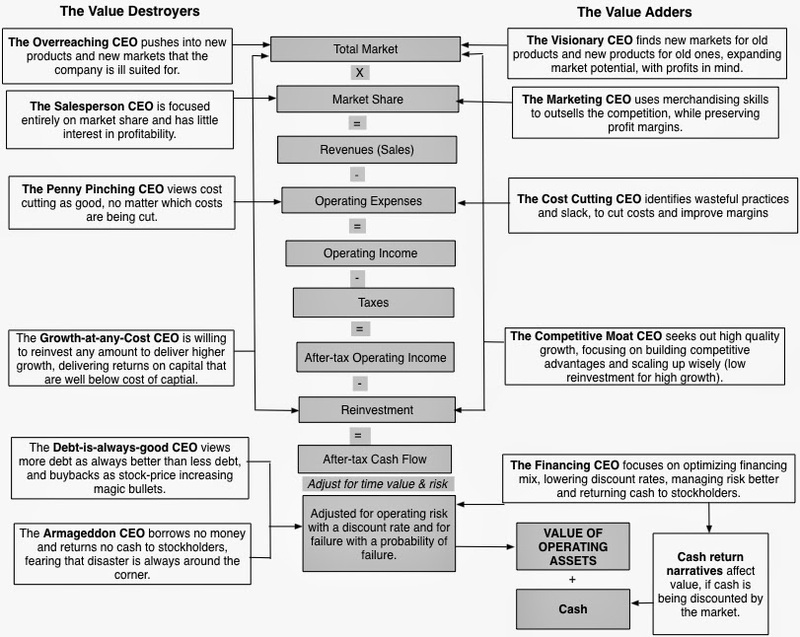 With the CEO in question, the value effect will depend upon the changes you see that CEO making in the company on one or more of these dimensions. If you are willing to be specific about those changes, you can use this spreadsheet to see the value added by a new CEO and how much you would be willing to pay on an annual basis for that CEO. I took the spreadsheet for a spin, using Microsoft as my example, partly because Satya Nadella, Microsoft's CEO, topped the list of highest paid CEOs last year and partly because I have been a stockholder in Microsoft since this post in 2013. If you assume that all that Mr. Nadella can do is slow the slide in margins, he will be able to add $7.74 billion in value to the company (about 2.25% of the company's value), translating into annual compensation of $670 million a year. While I do not agree with everything that Mr. Nadella has done over the last year at Microsoft, I think that he has done enough for me as a stockholder that I don't begrudge him his $84 million pay package. I believe that Microsoft's board will have to monitor revenue growth and margins to see if he continues delivering, but this analysis indicates how dangerous it is to conclude that a CEO is being paid too much, just because he or she has a large pay package. Using this framework, we can make judgments on the types of companies that CEOs are most likely to make a difference, in good or bad ways. Life Cycle: A CEO should be able to make a much bigger difference in value early in the life cycle, when potential markets are still being defined and setting and having a coherent and consistent narrative can make the difference between winners and losers. As the firm matures, the CEO's capacity to affect value positively will decrease, though the capability of creating damage (by over reaching) may increase. Market and Competition: A CEO should have a much bigger impact on value in companies that operate in competitive businesses, where finding and maintaining a competitive edge separates the winners from the losers. In fact, there is research that backs up this contention, with CEO pay being higher, on average, and more tied to performance in more competitive businesses. Macro versus micro firms: I believe that the value effect that a CEO has on a company is more muted at companies whose value is driven primarily by macro forces (commodity prices, exchange rates, interest rates) than at companies where value is more determined by micro factors (markets targeted, pricing policies etc.). After all, if 80% of the variation in earnings across time is caused by oil price movements, there is not a whole lot that you can do, as a CEO, to affect earnings, an argument that Harold Hamm, CEO of Continental Resources, used in his recent divorce fight. Small versus Large firms: The value impact that a CEO can have at a large firm will be much higher in absolute terms than at a small firm, simply because the effects of small operating changes in the company can translate into large absolute changes in value. While this may seem to contradict the life cycle argument, we can reconcile the two, if we think about percentage changes in value. A CEO at small, young company will have a much higher percentage effect on value than the CEO at a larger, more mature company, but the latter will still have the larger effect on dollar value. The skill set and qualities that make for a value-adding CEO will vary across companies. For a start-up or young growth company, the qualities that create a stand out CEO will be imagination, charisma and narrative skills. For a mature company, CEO greatness may stem from understanding capital markets and sector dynamics and less from vision and imagination. In decline, a company may be best served by a CEO who can deal with slipping revenues and shrinking margins, while managing the return of cash to stockholders and lenders in the firm. It should come as no surprise then, that what makes a founder CEO an asset early in a company's life may him a liability, as the firm matures, and that the skills that made a CEO successful in turning around one company may not be the ones that work in another. If it is true that CEOs are priced and not valued, and that as stockholders in many companies, we are overpaying for our CEOs, what can we do to remedy this problem? I would not look to regulators, governments or tax laws to fix this problem, since these fixes (like the 1993 compensation law) not only operate as bludgeons, but have unintended and perverse consequences. I think that the answer has to be in good corporate governance in the true sense of the words, where shareholders are provided the information and the power to make decisions about CEO pay in the companies that they invest in, and use both effectively. I believe that information on CEO compensation should be revealed to stockholders on a comprehensive and timely basis, that shareholders should have a say on how much CEOs get paid and the power to replace directors who are casual about compensation. The SEC has moved in the right direction on all three fronts, with increased disclosure requirements on CEO pay, by requiring that shareholders be given a "say on pay" at companies and by easing challenges to incumbent directors. On each one, though, there has been push back from defenders of the status quo and the SEC has been unable or unwilling to go the distance. Even in a world where disclosure is complete and shareholders are empowered, I recognize that giving shareholders the power to challenge and change management at public companies does not mean that they will use that power often or wisely. Just as voters in a democracy get the government that they deserve, shareholders in companies get the CEOs (and CEO pay packages) that they deserve. Paraphrasing Shakespeare, shareholders who complain loudly and often about CEO excesses should recognize that "the fault is not in their stars but in themselves", have to stop looking to others to make things right and start voting with their shares rather than their feet. The Search for Investment Serenity: The Look Back Test! Late last year, in a post titled “Go where it is darkest”, I argued that the best investment opportunities are likely to be found in the midst of fear and uncertainty. I looked at two companies, Vale and Lukoil, that were caught up in perfect storms, where commodity prices had moved against them, the countries (Brazil and Russia) that they were located in were in turmoil, the local currencies were in retreat and the companies themselves faced corporate governance questions. I concluded that post with the statement that I was investing in Vale and Lukoil, notwithstanding the high risk in each one and the uncertainty that I felt about valuing them, because the risk/return trade off seemed to be tilted in my favor. A few months later, with my investment in Vale down substantially and the investment in Lukoil treading water, I decided to revisit the valuations. Looking Back: Testing your investment serenity! Satchel Paige is rumored to have once said “Don’t look back. Something might be gaining on you” and most of us take his advice to heart, especially when it comes to investments that have gone bad. We spend almost all of their time thinking about investments that we can add to their portfolios, we repeatedly check on our "winners", crediting ourselves for our foresight in picking them, and we studiously avoid looking at the "losers". Studies of investor behavior find substantial evidence that investors hold on to losers too long and that they are quick to blame outside sources or bad luck for these losers, while attributing winners to their stock picking skills. I believe that the biggest mistakes in investing are made not in what or when you buy, but in what or why you choose not to buy and what and when you sell (what you have already bought). I know that I need to look at my past investments, not to lament mistakes I have made or to wallow in regret, but because each investment in my portfolio has to meet the same test to remain in my portfolio, as it did when I first bought it. As an intrinsic value investor, that test is a simple one. I should buy when a stock trades at a price below its value and should not if it trades above value. Consequently, when I look at my portfolio this morning, I should apply the same rule to every investment in it, asking whether at today’s price and today's estimated value, I should buy more of that stock (if it has become even more under valued), hold on to it (it is remains under valued or has become fairly valued) or sell the stock (if it has become over valued). Simple, right? Yes, if are a serene investor who can be dispassionate about past mistakes and rational in your judgments. I am anything but serene, when it comes to assessing past investments and I know that what I choose to do will often be guided by the worst of my emotions, rather than good sense. I will double up (or down) on my losing investments, not because they have become more under valued, but because of hubris, will hold on to my losers, because denial is so much easier than admitting to a mistake, and sell because of panic and fear. While I cannot will myself to rationality, there are things that I try to do to counter my all-too-human emotions. Due Process: Left to my own devices, I know that I will selectively revalue only those investments that I like, and only at the times of my choosing, and ignore revaluations that will deliver bad news. It is for this reason that I force myself to revalue each investment in my portfolio at pre-specified intervals (at least once a year and around significant news stories). Spread my bets: I have found that I am far more likely to both panic and be defensive about investments that are a large portion of my portfolio than for investments that are small, one reason I stay diversified across many stocks (each of which passes my investment test) rather than a few. Be explicit in my valuation judgments: I have found that is far easier to be delusional when you buy and sell based upon secretive, complex and closed processes. It is one reason that I not only try to keep my valuation assumptions explicit but also share my valuations. I know that someone will call me out on my delusions, if I try to tweak them to deliver the results that I want. Admit publicly to being wrong: I have tried to be public about admitting mistakes, when I make them, because I have found that it frees me to clear the slate. I must admit that it does not come easily to me, but each time I do it, I find it a little easier than the last time. Have faith but don't make it doctrine: I have faith (misplaced though it might be) that I can estimate intrinsic value and that the price will eventually converge on the value and that faith is strong enough to withstand both contrary market movements and investor views. At the same time, I know that I have to be willing to modify that faith if the facts consistently contradict it. I can hope that one day my investment decisions will not be driven by need to defend, deny or flee from past mistakes, but I am still a work in progress in my quest for investment serenity. The Macro Argument: I argued that since both companies were being weighed down by a combination of commodity price, country, currency and company risk, a lifting of any one of these weights would work in favor of my investment. I did confess that I had no market timing skills on any of these fronts and that I was drawing on statistical likelihood that one or another of these weights would lift. The Micro Story: I picked these companies in particular, rather than others in these markets that faced the same risks, because I felt that they were better positioned both in term of surviving continued market troubles and that they were under valued. In November 2014, I felt that Vale was a better bet than Petrobras, partly because it carried less debt and partly because the Brazilian government had not been as active in directing how the firm was run. At that time, Lukoil carried less debt, was less entangled with the Russian government and had better corporate governance (everything is relative) than Gazprom or Rosneft, two other Russian commodity companies. At $8.53/share, it looked under valued to me, even with significant drops built into its operating income. 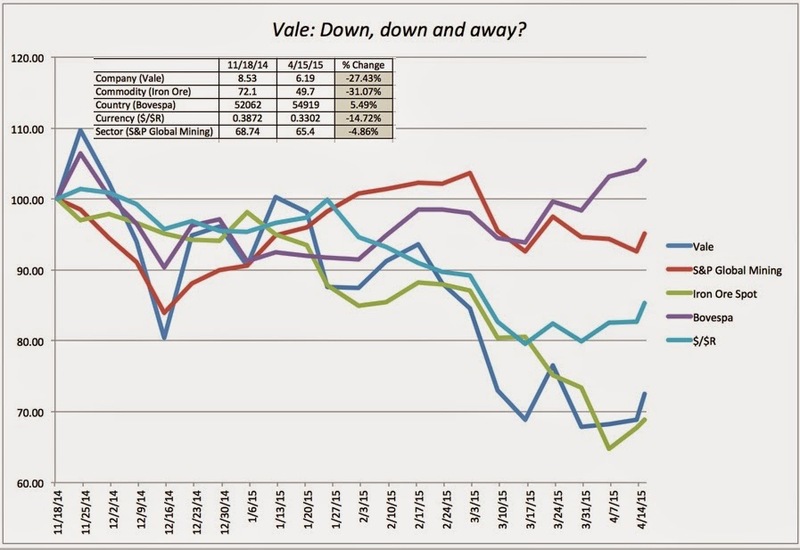 It was not as under valued as Vale was, but under valued enough that I was comfortable buying the stock. With both investments, it was the micro bet (that the stock was under valued) that drove my investment but I held out hope that one or more of the macro variables would move in my favor. The stock stands as testimonial to one of the dangers of investing on the dark side. Just as you think things are very dark, they can get even darker. In the five months, iron ore prices have dropped 31.07% and Vale, as the largest iron ore producer in the world, has felt the pain. The pain is accentuated by Brazil’s slide in international markets, as its currency has lost almost 15% of its value, relative to the US dollar. The news story that has dominated the news is the ongoing corruption scandals at Petrobras and Vale, in my view, has been caught int he under currents. 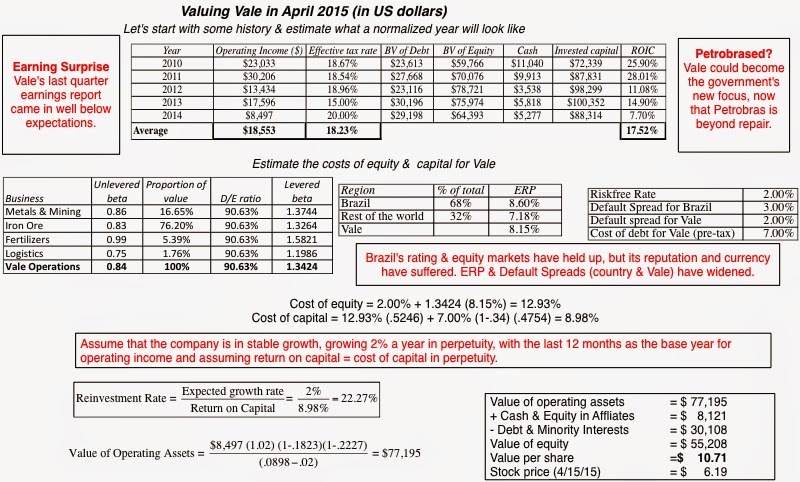 Vale, after all, shares many characteristics with Petrobras, with the Brazilian government controlling management through a golden share and control of voting shares, a captive board of directors and a dividend policy on auto pilot. At the value that I obtain, $10.71 per share, the stock is under valued by about 42% at its stock price of $6.19 on April 15, but that value is down dramatically from the $19.40/share that I estimated last November. Part of the reason lies in the fundamentals (with commodity prices dropping and country risk expanding) but part of it reflects my valuation mistakes (a failure to adjust operating income adequately for the drop in iron ore prices). Notwithstanding my failures at forecasting, at today's price and value, I would have no qualms about buying the stock. I know that I may be letting my desire to be right override my good sense and setting myself for more pain in the future, and I am aware that there are three big dangers that await me. First, the reported earnings for 2014 reflect some, but not all, of the damage from lower iron ore prices, and it is almost certain that there will be more bad news on earnings this year. Second, the decline in iron ore prices shows no sign of letting up and it is possible that there will be no bounce back in iron ore prices for a while. Third, now that the Petrobras goose has stopped laying golden eggs, the Brazilian government may turn its attention and interest to Vale and that would be deadly for investors. 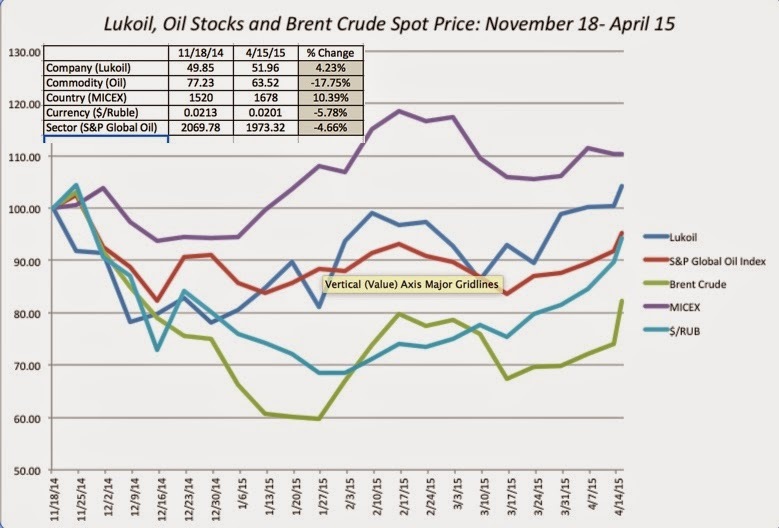 The last five months have been interesting ones in the oil market, as oil prices have continued to slide. 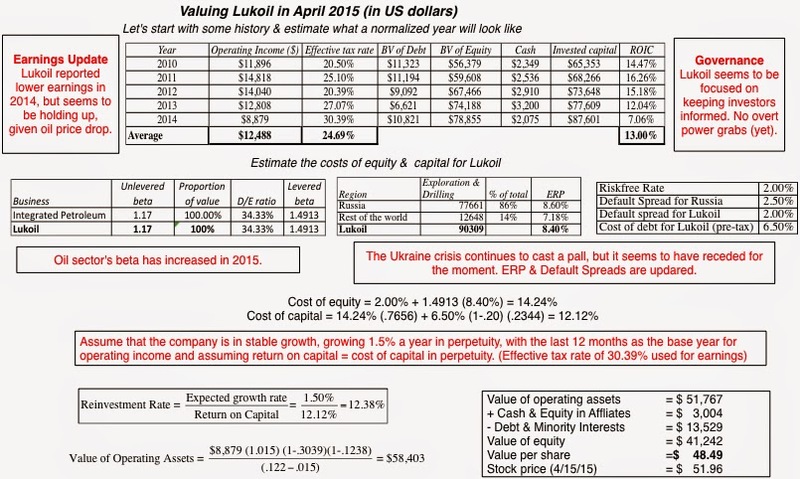 In the graph below, I look at Lukoil from the date of my original purchase through April 15. In a period where oil prices dropped 17.75% and the global oil index declined by 4.66%, Lukoil held up remarkably well, increasing 4.23%. Much as I would like to claim credit for my stock picking skills, it is worth noting that the MICEX was up 10.39% in local currency terms and about 5% in US dollar terms over the same period. 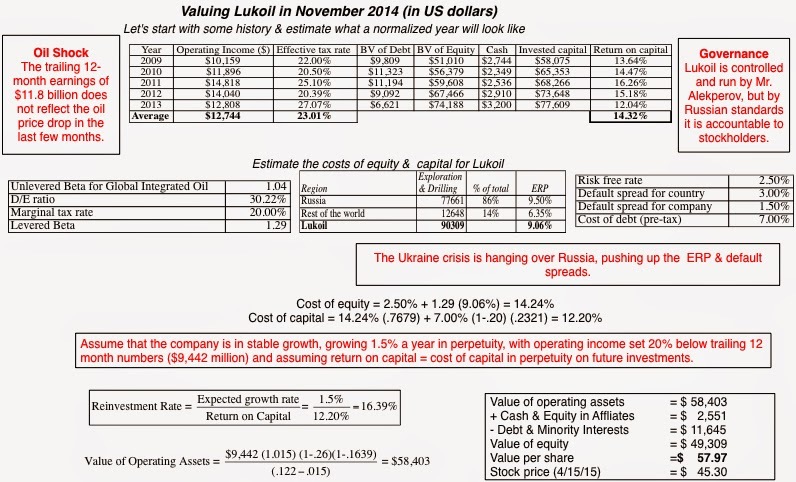 As with Vale, I revisited my valuation of Lukoil, updating the numbers to reflect an earnings report from the company and updated market numbers. The value has dipped slightly to $48.49/share, largely as a consequence of lower oil prices, and the price has risen slightly to $51.69/share, leaving me with the end result that the stock is slightly over valued today. If I were making a decision on whether to buy the stock today, I would be not buy the stock, but since I have it in my portfolio already, I am inclined to hold on to it, since it is close to fairly valued. As you can sense from my ramblings during this post, what started as an assessment of whether Vale and Lukoil should continue to be part of my portfolio has become a rumination on the much bigger question of investing faith and philosophy. In investing, I think it is dangerous to have both too little faith and too much. If you have too little faith, you will abandon your investments too quickly, if the market moves against you or if others seem to be doing much better than you are. If you have too much faith, you can cross the line into fanaticism, where you are so convinced of your rightness that you ignore facts to the contrary. I hope that my faith in my intrinsic value is both strong enough to withstand short terms set backs and to adapt to changing market circumstances and that I can find some measure of investment serenity. The Small Cap Premium: Where is the beef? On closer scrutiny, the historical data, which has been used as the basis of the argument, is yielding more ambiguous results and leading us to question the original judgment that there is a small cap premium. The forward-looking risk premiums, where we look at the market pricing of stocks to get a measure of what investors are demanding as expected returns, are yielding no premiums for small cap stocks. If the justification is intuitive, i.e., that smaller firms are riskier than larger firms, much of that additional risk is either diversifiable, better adjusted for in the expected cash flows (instead of the discount rate) or double counted. The small cap premium is a testimonial to the power of inertia in corporate finance and valuation, where once a practice becomes established, it becomes difficult to challenge, even if the original reasons for it have long since disappeared. 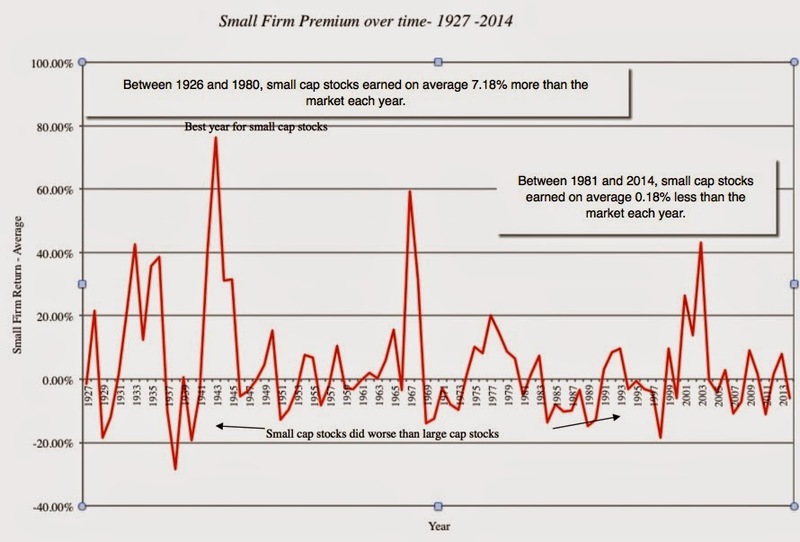 The first studies that uncovered the phenomenon of the small cap premium came out in the 1970s. They broke companies down into deciles, based on market capitalization, and found that companies in the lowest decile earned higher returns, after adjusting for conventional risk measures, than companies in the highest decile. I updated those studies through the end of 2014, and the small cap premium seems intact (at least at first sight). In summary, looking at returns from 1926 to 2014, the smallest cap stocks (in the lowest decile) earned 4.33% more than the market, after adjusting for risk. That discount rate is used to estimate the value of future cash flows, and not surprisingly, the use of a small cap premium lowers the value of smaller companies. In investing, it has been used as a weapon both for and against active investing. Those who favor active investing have pointed to the small cap premium as a justification for their activity, and during the periods of history when small cap companies outperformed the market, it did make them look like heroes but it quickly gave rise to a counterforce, where performance measurement services (like Morningstar) started incorporating portfolio tilts, comparing small cap funds against small cap indices. Since almost all of the "excess returns" disappeared on this comparison, it was only a matter of time before index funds entered the arena, creating small-cap index funds for investors who wanted to claim the premium, without paying large management fees. Trend lines and Time Periods: Small cap stocks have earned higher returns than large cap stocks between 1928 and 2014 but the premium has been volatile over history, disappearing for decades and reappearing again. While the premium was strong prior to 1980, it seems to have dissipated since 1981. One reason may be that the small cap premium studies drew attention and investor money to small cap stocks, and in the process led to a repricing of these stocks. Another is that the small cap premium is a side effect of larger macroeconomic variables (inflation, real growth etc.) and that the behavior of those variables has changed since 1980. Microcap, not small cap premium: Even over the long time period that provides the strongest support for existence of a small cap premium, one study finds that removing stocks with less than $5 million in market cap causes the small firm effect to vanish. 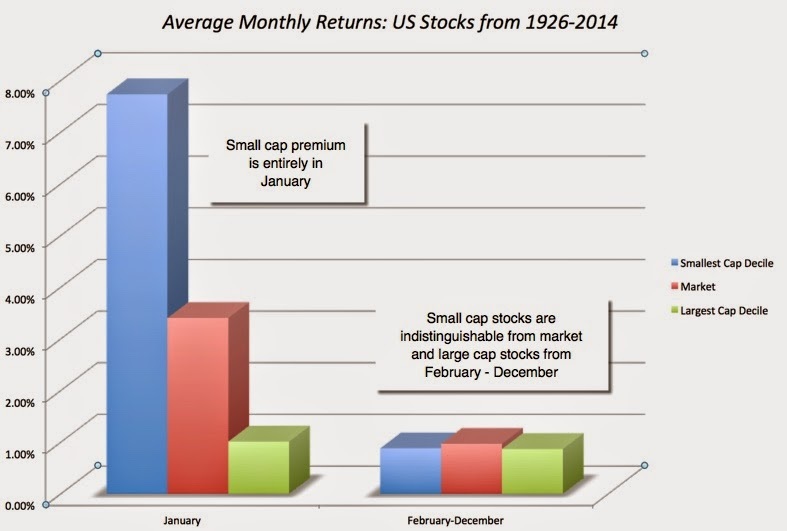 In effect, what you have is microcap premium, isolated in the smallest of stocks, not just small stocks. Standard Error: Historical equity returns are noisy and any estimates of risk premium from that data will reflect the noise in the form of large standard errors on estimates. I have made this point about the overall historical equity risk premium but it becomes magnified when you dice and slice historical data into sub-classes. The table below lists standard errors in excess returns by decile class and reinforce the notion that the small cap premium is fragile, barely making the threshold for statistical significance over the entire period. The January Effect: One of the most puzzling aspects of the small cap premium is that almost all of it is earned in one month of the year, January, and removing that month makes it disappear. So what? If your argument for the small cap premium is that small cap stocks are riskier, you now have the onus of explaining why that risk shows up only in the first month of every year. Weaker globally: The small cap premium seems to be smaller in non-US markets than in US markets and is non-existent in some. In contrast, the value effect (where low price to book stocks outperform the market) is strong globally. Proxy for other factors: A host of papers argue that the bulk or all of the small size effect can be attributed to a liquidity effect and that putting in a proxy for illiquidity makes the size effect disappear or diminishes it. Works only with market cap: Finally, you can take issue with the use of a market-priced based measure of size in a study of returns. Others have tried other non-price size measures such as income or revenues but there seems to be no size effect in those variables. A recent working paper by Asness, Frazini, Israel, Moskowitz and Pedersen tries to resurrect the size effect, but accomplishes it only by removing the subset of small companies that they classify as "low quality" or "junk". While the results are interesting and can be used by active small-cap fund managers as a justification for their activity, they are in no way a basis for adding a small cap premium to every small company, and asking analysts to add it on only for small, high quality companies is problematic. In summary, if the only justification that you can offer for the addition of a small cap premium to your discount rate is the historical risk premium, you are on thin ice. If the historical data ceases to support the use of a historical risk premium, can we then draw on intuition and argue that since small companies tend to be riskier (or we perceive them to be), investors must require higher return when they invest in them? You can, but the onus is then on you to back up that intuition. In fact, you can check to see whether investors are demanding a forward looking "small cap" premium, by looking at how they price small as opposed to large companies, and backing out what investors are demanding as expected returns. Put simply, if small cap stocks are viewed by investors as riskier and that risk is being priced in, you should expect to see, other things remaining equal, higher expected returns on small cap stocks than large cap stocks. In effect, to the extent that my base year cash flows are reasonable and my expected growth rate reflects market expectations, the expected return on large cap stocks on January 1, 2015 was 7.95% in the US (yielding an overall equity risk premium of 5.78% on that day). In effect, the market is attaching a smaller expected return for small cap stocks than large ones, stories and intuition notwithstanding. I am not surprised that the market does not seem to buy into the small cap premiums that academics and practitioners are so attached to. After all, if the proponents of small cap premiums are right, bundling together small companies into a larger company should instantly generate a bonus, since you are replacing the much higher required returns of smaller companies with the lower expected return of a larger one. In fact, small companies should disappear from the market. If illiquidity is your bogey man in valuation, why use market capitalization as a stand-in for it? Market capitalization and illiquidity don't always go hand in hand, since there are small, liquid companies and large, illiquid ones in the market. Four decades ago, your excuse would have been that the data on illiquidity was either inaccessible or unavailable and that market capitalization was the best proxy you could find for illiquidity. That is no longer the case and there are studies that categorize companies based on measures of illiquidity (bid ask spread, trading volume) and find an "liquidity premium" for illiquid companies. If illiquidity is what you are adjusting for in the small cap premium, why is it a constant across companies, buyers and time? Even if your defense is that the small cap premium is an imperfect (but reasonable) measure of the illiquidity premium, it is unreasonable to expect it to be the same for every company. Thus, even if you are valuing just privately owned businesses (where illiquidity is a clear and present danger), that illiquidity should be greater in some businesses than in others and the illiquidity (or small cap) premium should be larger for the former than the latter. Furthermore, the premium you add to the discount rate should be higher in some periods (during market crises and liquidity crunches) than others and for some buyers (cash poor, impatient) than others (patient, cash rich). Even if you can argue that illiquidity is your rationale for the small cap premium and that it is the same across companies, why is it not changing over the time horizon of your valuation (and especially in your terminal value)? In any valuation, you assume through your company's cash flows and growth rates that your company will change over time and it is inconsistent (with your own narrative) to lock in an illiquidity premium into your discount rate that does not change as your company does. Thus, if you are using a 30% expected growth rate on your company, your "small" company is getting bigger (at least according to your estimates) and presumably more liquid over time. Should your illiquidity premium therefore not follow your own reasoning and decrease over time? If your argument is that size is a good proxy for illiquidity, that all small companies are equally illiquid and that that illiquidity does not change as you make them bigger, why are you reducing your end value by an illiquidity discount? This question is directed at private company appraisers who routinely use small cap premiums to increase discount rates and also reduce the end (DCF) value by 25% or more, because of illiquidity. You can show me data to back up your discount (I have seen restricted stock and IPO studies) but none of them can justify the double counting of illiquidity in valuation. Why are we slow to give up on the “small cap” premium? It is true that the small cap premium is established practice at many appraisal firms, investment banks and companies. Given the shaky base on which it is built and how much that base has been chipped away in the last two decades, you would think that analysts would reconsider their use of small cap premiums, but there are three powerful forces that keep it in play. Intuition: Analysts and investors not only start of with the presumption that the discount rates for small companies should be higher than large companies, but also have a “number’ in mind. When risk and return models deliver a much lower number, the urge to add to it to make it "more reasonable" is almost unstoppable. Consequently, an analyst who arrives at an 8% cost of equity for a small company feels much more comfortable after adding a 5% small cap premium. It is entirely possible that you are an idiot savant with the uncanny capacity to assess the right discount rate for companies, but if that is the case, why go through this charade of using risk and return models and adding premiums to get to your "intuited" discount rate? For most of us, gut feeling and instinct are not good guides to estimating discount rates and here is why. Not all risk is meant for the discount rate, with some risk (like management skills) being diversifiable (and thus lessened in portfolios) and other risks (like risk of failure or regulatory approval) better reflected in probabilities an expected cash flow. A discount rate cannot and is not meant to be a receptacle for all your hopes and fears, a number that you can tweak until your get to your comfort zone. Inertia (institutional and individual): The strongest force in corporate finance practice is inertia, where much of what companies, investors and analysts do reflects past practice. The same is true in the use of the small cap premium, where a generation of analysts has been brought up to believe (by valuation handbooks and teaching) that it is the right adjustment to make and now do it by rote. That inertia is reinforced in the legal arena (where many valuations end up, either as part of business or tax disputes) by the legal system’s respect for precedence and general practice. You may view this as harsh, but I believe that you will have an easier time defending the use of a bad, widely used practice of long standing in court than you would arguing for an innovative better practice. Bias: My experiences with many analysts who use small cap premiums suggest to me that one motive is to get a “lower” value". Why would they want a lower value? First, in accounting and tax valuation, the client that you are doing the valuation for might be made better off with a lower value than a higher one. Consequently, you will do everything you can to pump up the discount rate with the small cap premium being only one of the many premiums that you use to “build up” your cost of capital. Second, there seems to be a (misplaced) belief that it is better to arrive at too low a value than one that is too high. If you buy into this “conservative” valuation approach, you will view adding a small cap premium as costless, since even it does not exist, all you have done is arrived at “too low” a value. At the risk of bringing up the memories of statistics classes past, there is always a cost. While “over estimating” discount rates reduces type 1 errors (that you will buy an over valued stock), it comes at the expense of type 2 errors (that you will hold off on buying an under valued stock). 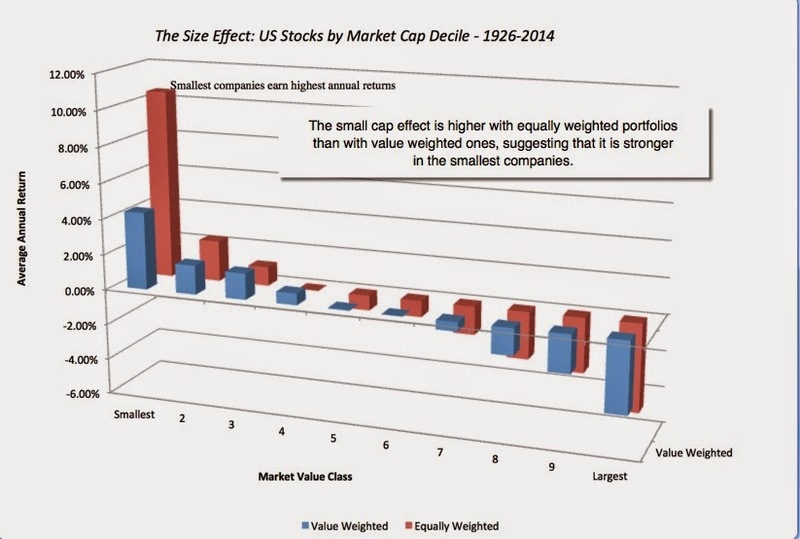 A Requiem for the Small Cap Premium? 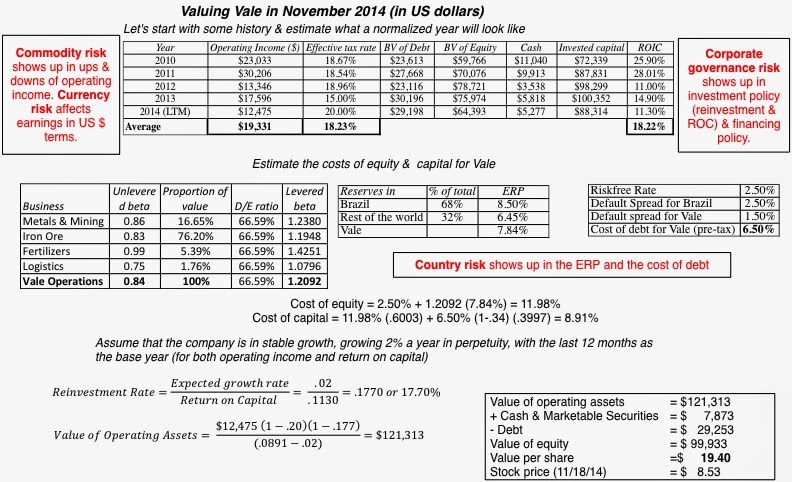 I have never used a small cap premium, when valuing a company and I don’t plan to start now. Needless to say, I am often asked to justify my non-use of a premium and here are my reasons. First, I am not convinced by either the historical data or by current market behavior that a small cap premium exists. Second, I do believe that small cap companies are more exposed to some risks than large cap companies but there are other more effective devices to bring these risks into valuation. If it is that they are capital constrained (i.e., that it is more difficult for small companies to raise new capital), I will limit their reinvestment and expected growth (thus lowering value). If it is that they have a greater chance of failure, I will estimate a probability of failure and reflect that in my expected value (as I do in my standard DCF model). If it is illiquidity that is your concern, it is worth recognizing that one size will not fit all and that the effect on value will vary across investors and across time and will be better captured in a discount on value. What is your justification for using a small cap premium? If the defense is pointing to history (or a data table in a service), it is paper thin, since that historical premium defense seems to have more holes in it than Swiss cheese. If it is intuitive, i.e., that small companies are riskier and markets must see them as such, I don't see the basis for the intuition, since the implied costs of equity for small companies are no higher than those of large companies. If the argument is that everyone does it, I am sorry but just because something is established practice does not make it right. What are the additional risks that you see in small companies that you don't see in large ones? I am sure that you can come up with a laundry list that is a mile long, but most of the risks on the list either don't belong in the discount rate (either because they are diversifiable or because they are discrete risks) or can be captured through probability estimates. If it is illiquidity that you are concerned about, see the section on illiquidity above for my response. If you are investors, here are the lessons I draw from looking at the data. If you are following a strategy of buying small cap stocks, expecting to be rewarded with a premium for just doing that, you will be disappointed. Even the most favorable papers on the small cap premium suggest that you have to add refinements, with some suggesting that these refinements should screen out the least liquid, riskiest small cap stocks and others arguing for value characteristics (stable earnings, high returns on equity & capital, solid growth). I do think that there is a glimmer of hope in the recent research that the payoff to looking for under valued stocks may be greater with small companies, partly because they are more likely to be overlooked, but it will take more work on your part and it won't be easy! A few months ago, I tagged along with my wife and daughter as they went on a tour of the Federal Reserve Building in downtown New York. While the highlight of the tour is that you get to see large stacks of US dollars in the basement of the building, I considered making myself persona non grata with my immediate family by asking the guide (a very nice Fed employee) about the location of the interest rate room. That, of course, is the room where Janet Yellen comes in every morning and sets interest rates. I am sure that you can visualize her pulling the levers that sets T.Bond rates, mortgage rates and corporate rates and the power that comes with that act. If that sounds over the top, that is the impression you are left with, not only from reading news stories about central banks, but also from opinion pieces from some economists and investment advisors. I know that investors, analysts and CFOs are all rendered off balance by low interest rates, but I will argue that the techniques that they use to compensate are more likely to get them in trouble than solve their problems. 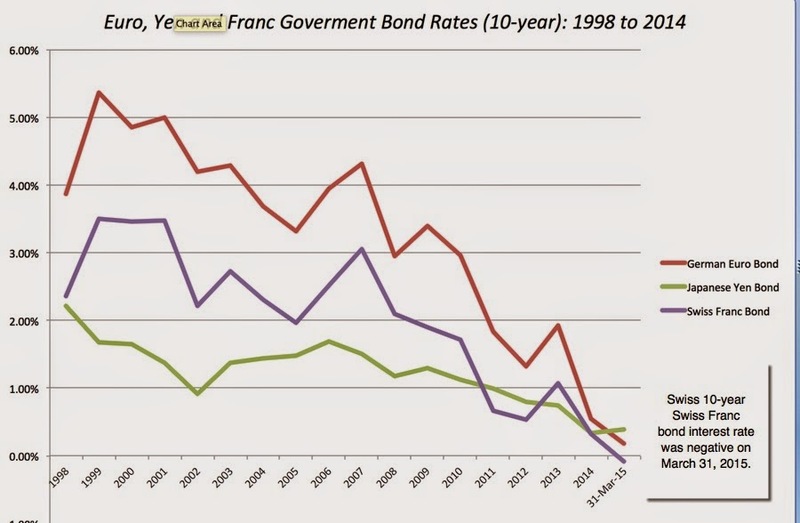 In fact, on the Swiss Franc, the 10-year bond rates rates have not just dropped but have hit zero and kept going to -0.09%, leading to the almost unfathomable phenomenon of negative interest rates on long term borrowing. A world where savers have to pay banks to keep their savings and borrowers are paid money to borrow turns everything that we have learned in economics on its head and it is therefore no surprise that even seasoned investors and analysts are unsure of what to do next. 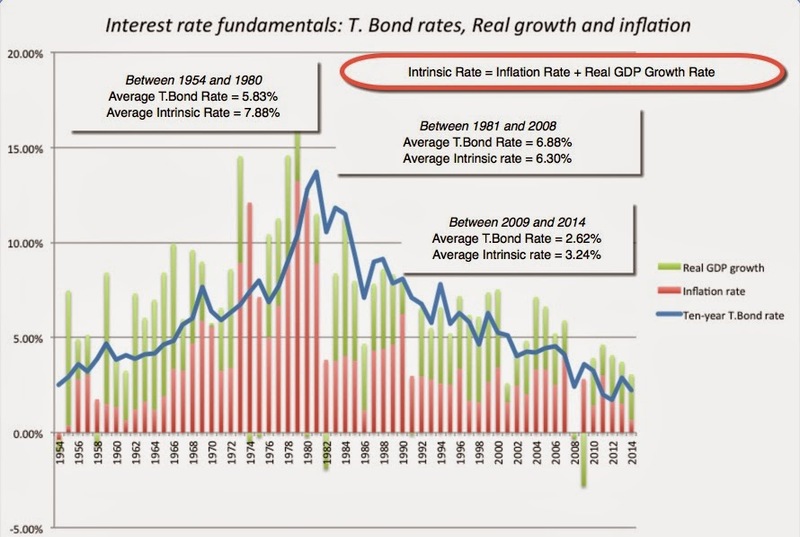 Why are interest rates so low? I know that the conventional wisdom is that it is central bank policy that has driven them there, but is that true? To answer that question, I decided to do go back to basics. How well does this simplistic equation hold up in practice? Testing it is hard, especially when you can observe only actual inflation and real growth but not expected inflation and real growth. However, we also know that expectations for inflation and real growth are driven, for better or worse, by recent history; thus expected inflation increases after periods of high inflation and decreases after periods of low inflation, thus making actual inflation and real growth reasonable proxies for expected values. The final number we need to test out this relationship is the interest rate on a guaranteed investment, and we use the US 10-year treasury bond rate as the stand in for that number, with the concession that the last 5 years have shaken investor faith in the guarantee. Even if you take issue with my proxies for expected inflation (the actual inflation rate in the US each year, as measured by the CPI), real growth (the real growth rate in US GDP and the interest rate on a guaranteed investment, the graph sends a powerful message that risk free rates are driven by inflation and real growth expectations. If expected inflation is low and real growth is anemic, as has been the case since 2008, interest rates will be low as well and they would have been low, with or without central bank intervention. Note that the Fed Funds rate hit zero in 2009 and has stayed there for the last five years, effectively eliminating it as a tool for controlling rates. Perhaps driven by desperation and partly motivated by the savior complex, the Fed has turned to a relatively unused tool in its arsenal and bought large quantities of US treasury bond in the market for the last five years, the much-talked about Quantitative Easing (QE). While it is true that T.Bond rates have stayed below intrinsic interest rates over the last 5 years, the effect of QE (at least to my eyes) seems to modest. As the economy comes back to life, all eyes have turned towards Janet Yellen and the Fed and Fed-watching has become the central focus for many investors. While that is understandable, it is worth remembering that in today's economic environment, with low inflation and real growth, the removal of the Fed prop will not cause interest rates to pop to 5% or 6% . 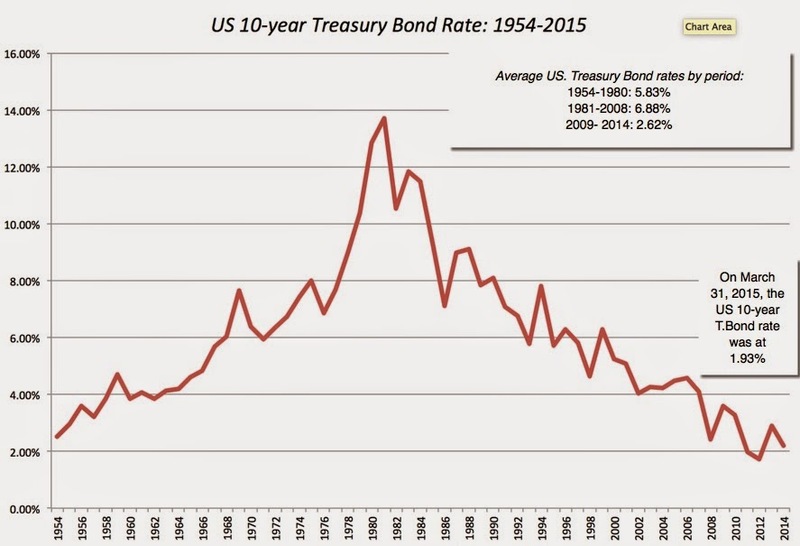 In fact, based upon the numbers in the most recent year, the intrinsic interest rate is 3.08% and if the central banking props disappear, that would be the number towards which US treasury bond rates move. Given the evidence to the contrary, it is puzzling that investors continue to hold on to the belief that central banks set interest rates and can change them on whim, but I think that the delusion serves both sides (investors and central banks) well. Investors, whipsawed by market and economic forces that are uncontrollable, feel comfort in attributing the power to set interest rates to central banks. It also allows investors to attribute every phenomenon that they have trouble explaining to central banking machinations and interest rates that are either "too high" or "too low". Quantitative Easing in all its forms has proved to be absolutely indispensable as a bogey man that you can blame for the failure of active investing, the rise and fall of gold, and bubbles of every type. Central banks, which are really more akin to the Wizard of Oz, in their powers, than Masters of the Universe, are glad to play along, since their power comes from the illusion that they have real power. There is another factor at play that may be more powerful than central banks, at least over short periods, and that is the perception of a crisis. Whatever the origins or form of the crisis, investors respond with fear, and flee to safety. That "flight to quality" often manifests itself in declining interest rates on bonds issued by governments that are perceived as "higher quality", and may push those rates well below intrinsic levels. Looking at the chart where we outline the gap between the T.Bond rate and its intrinsic value, the quarter where we saw the US 10-year treasury bond rate drop the most, relative to its intrinsic value, was the last quarter of 2008, where the crisis in financial markets led to a rush into US treasuries. 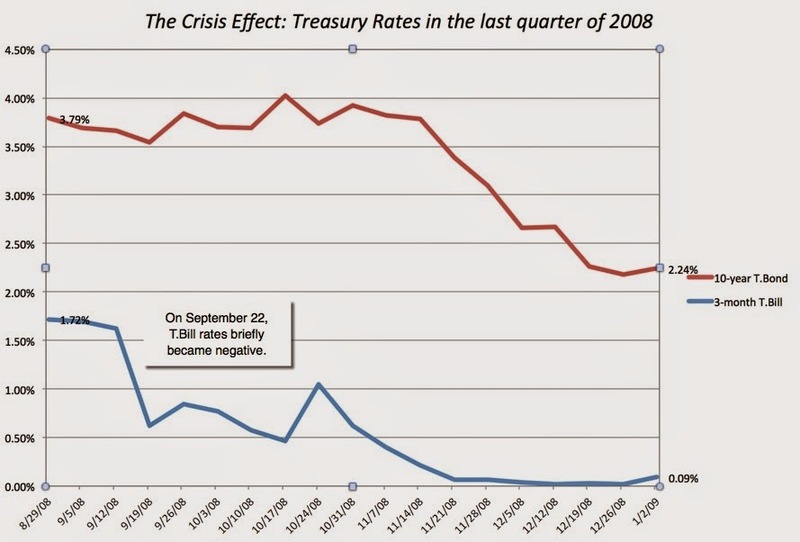 That translated into a precipitous drop in treasury rates across the board, with the 10-year rate dropping from 3.66% on September 12, 2008, to 2.2% at the end of 2008, and the T. Bill rate declining from 1.62% to 0.02% over the same period. One of the few constants over the last six years has been that we lurch from one crisis to another, with local problems quickly going global. While there are some who may argue that this is a passing phase, I believe that this is part and parcel of globalization, one of the negatives that need to get offset against its positives. As economies and markets become increasingly interconnected, I think that the recurring crisis mode will be a permanent feature of market. One consequence of that may be that market interest rates on government bonds will settle below their intrinsic values, a permanent "crisis discount", with or without central banking intervention. That expected return then determines what we will be willing to pay for a risky asset, with lower expected returns translating into higher prices. For businesses, these expected return becomes hurdle rates (costs of equity and capital) that they use to decide not only whether and where they should invest their money but plays a role in how much they borrow and how much to return to stockholders (as dividends or buybacks). If the risk free rate drops and you leave the risk premiums and cash flows unchanged, the effect on value is unambiguously positive, with value rising as risk free rates drop. Thus, if you have a business that has $100 million in expected cash flows next year, with a growth rate of 4% a year in perpetuity and an equity risk premium of 4%, changing the risk free rate from 6% down to 2% will have profound effects on value. It is this value effect that has led some to blame the Fed for creating a "stock market bubble" and analysts across the world to wonder whether they should be doing something to counter that effect, in their search for intrinsic value. To illustrate, the 2008 crisis that caused the T.Bond rate to plummet in the last quarter of the year also caused equity risk premiums to surge from 4.37% on September 12, 2008 to 6.43% on December 31, 2008. In the figure below, I back out the expected return on stocks and the equity risk premium from the index level each day and the expected future cash flows for each month from September 2008 to April 2015. Note that the cost of equity for the median US company rose in the last quarter of 2008, even as risk free rates declined. The expected return on equities has stayed surprisingly stable (around 8%) for much of the last 5 years, nullifying the impact of lower interest rates and casting doubt on the "Fed Bubble" story. As the crisis has receded, investor concerns have shifted to real growth, as the developed market economies (US, Euro Zone and Japan) have been slow to recover and inflation has not only stayed tame but turned to deflation in the EU and Japan. Thus, looking just at lower interest rates and making judgments on value misses the big picture. Normalize: In valuation, it is common practice to replace unusual numbers (earnings, capital expenditures and working capital) with more normalized values. Some analysts extend that lesson to risk free rates, replacing today’s “too low” rates with more normalized values. While I understand the impulse, I think it is dangerous for three reasons. The first is that "normal" is a subjective judgment. I argue, only half in jest, that you can tell how long an analyst has been in markets by looking at what he or she views as a normal riskfree rate, since normal requires a time frame and the longer that time frame, the higher normal interest rates become. The second is that if you decide to normalize the risk free rate, you have no choice but to normalize all your other macro variables as well. Consequently, you have to replace today’s equity risk premium with the premium that fits best with your normalized risk free rate and do the same with growth rates. Put differently, if you want to act like it is 2007, 1997 or 1987, when estimating the risk free rate, your risk premiums and growth rates will have to be adjusted accordingly. The third is that unlike earnings, cash flows or other company-specific variables, where you are free to make your judgment calls, the risk free rate is what you can earn on your money today, if you don’t invest in risky assets. 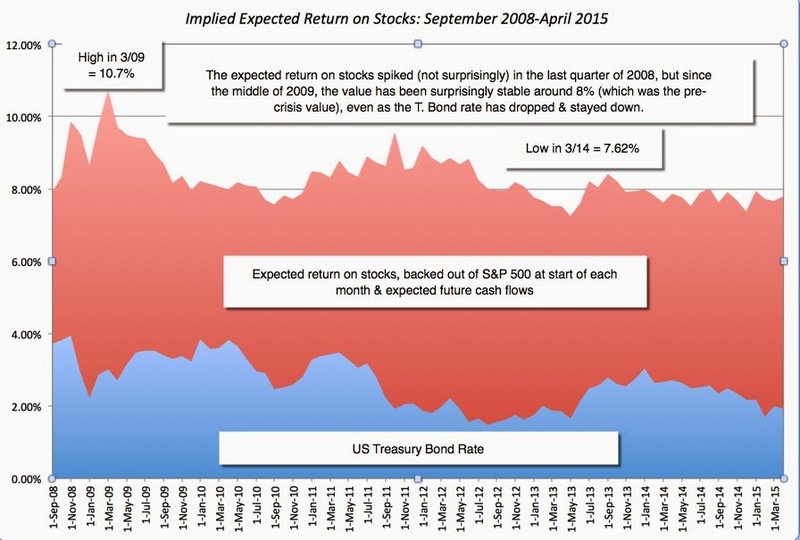 Consequently, if you do your valuation, using a normalized risk free rate of 4% (instead of the actual risk free rate of 2%), and decide that stocks are over valued, I wish you the very best of luck putting your money in that normalized treasury bond, since it exists only in your estimation. 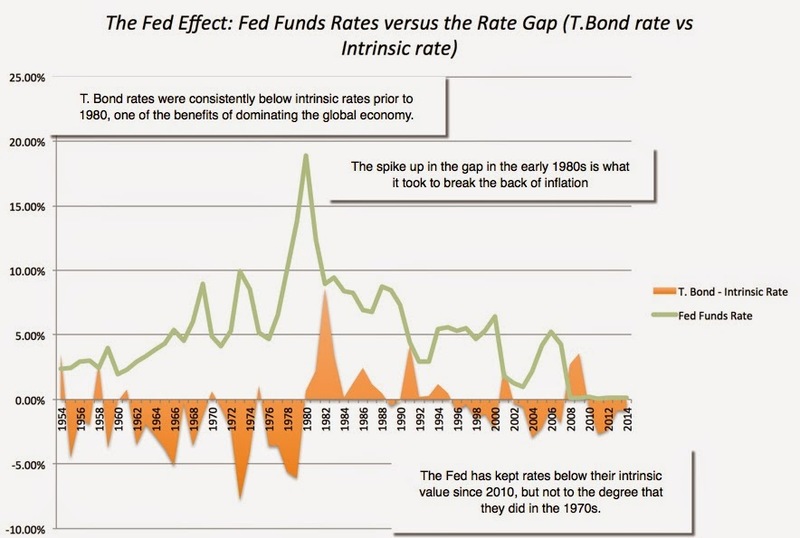 Go intrinsic: The second option, if you believe that the market interest rate on government bonds is being skewed by central banking action to abnormally low or high levels is to replace that rate with an intrinsic interest rate. If you buy into my estimates for inflation and real growth in the last section, that would translate into using a 3.08% “intrinsic” US treasury bond rate. To preserve consistency, you should continue to use the same inflation rate and real growth as your basis for forecasting earnings and cash flow growth in your company and going the distance, you should estimate an intrinsic ERP, perhaps tying it to fundamentals. Leave it alone: The third option is to leave the risk free rate at its current levels, notwithstanding concerns that you might have about it being too low or too high. To keep your valuation in balance, though, your other inputs have to be consistent with that risk free rate. That implies using forward-looking prices for risk (equity risk premiums and default spreads) that reflect the market today and economy-wide growth and inflation rates that are consistent with the current risk free rate. Thus, if you decide to use 0.21% as the risk free rate in Euros, the combination of inflation and real growth rates you have to assume in the Euro economy have to combine to be less than 0.21%. Doing so does not imply that you believe that nominal growth will be that low but ensures that you are making the same assumptions about nominal growth in the numerator (cash flows) as you are in the denominator (through the risk free rate). Leave it alone (for now) : The last option is to leave the risk free rate at current levels for now but adjust the rate in the future (perhaps at the end of your high growth period) to your normalized or intrinsic levels. Here again, the key is to make sure that your other valuation inputs are consistent with your assumption. 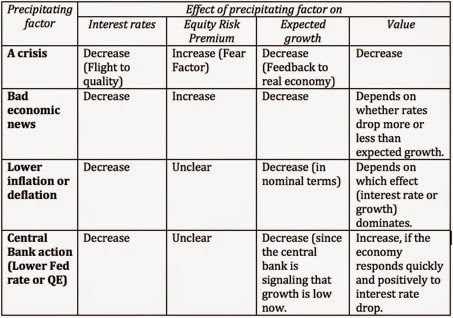 Thus, for the period you use the current risk free rate, you have to use equity risk premiums, growth rates and inflation expectations consistent with that rate, and as you adjust the risk free rate to its normalized or intrinsic levels, you have to adjust the rest of your inputs. The four choices yield different values but the most interesting finding is that the value that I get with the “leave alone” option is lower than the values that I obtain with my other options. Consequently, those who argue that we need to replace the current risk free rate with more normalized versions because it is the “conservative” path may be ending up with estimates of value that are too high (not too low). Note that while each input into these mismatched valuations may be defensible, it is the combination that skews the value vastly downwards or upwards. If you use or do intrinsic valuations, checking for input consistency is more critical than ever before. So, what is the bottom line? Like almost everyone else, I find myself in uncharted territory, with interest rates approaching zero in many currencies and like most others, I feel the urge to "fix" the problem. There are three broad lessons that I take away from looking at the data. Central banks tweak interest rates. They don’t set them. Consequently, I am going to spend less time worrying about what Janet Yellen does in the interest rate room and more on the fundamentals that drive rates. I will also grant short shrift to anyone who uses central banks as either an excuse or looks to them as a savior in their investing. When risk free rates are abnormally low or high, it is because there are other components in the market that are abnormal, and I am not sure what is normal. For investors in the US and Europe who yearn for the normality of decades past, I am afraid that normal is not returning. We have to recalibrate our assumptions about what is normal (for interest rates, risk premiums, inflation and economic growth) and pay less heed to rules of thumb that were developed for another market (US in the 1900s) and another time. As investors, we can rage against interest rates being too low but it is what it is. We have to value companies in the markets that we are in, not the markets we wished we were in.